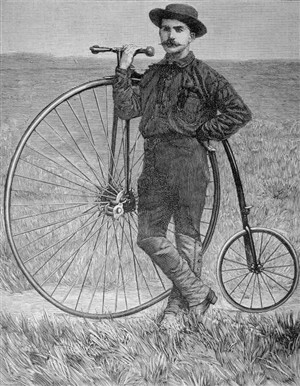 Round the world on a penny farthing | The Dacorum Heritage Trust Ltd.
“Our hero stands 5ft. 6in., he is built like a compressed giant, bears the stamp of personal courage and chivalrous enthusiasm upon his handsome features and, whether you call him Briton or Yankee, reflects honour upon the Anglo- Saxon stock, of which he is a magnificent type. Long Live Tom Stevens!” The Outing. Thomas Stevens was born in one of the old cottages in Castle Street, Berkhamsted, in 1854, the eldest son of William Stevens, a labourer. 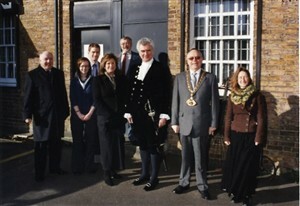 On leaving the Bourne Charity School, he was apprenticed to a Berkhamsted grocer and became the main breadwinner when his father emigrated to Missouri in 1868. Before he could arrange for his family to follow him, his wife became ill and he returned to Berkhamsted. By 1871, Tom had saved enough money to go out to America by himself and two years later his parents and brothers followed him. 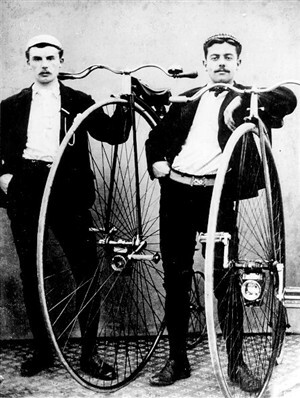 Tom moved to Denver and then to San Francisco, where he learned to ride a ‘Pennyfarthing’ cycle and he soon embarked on the first successful bike ride coast to coast across America. Setting off from San Francisco in April 1884, he pedalled, pushed and carried the heavy machine over the Rocky Mountains, through deserts and forests and across new farmlands. The 4,000-mile journey ended at Boston 104 days later. A world tour followed, sponsored by Colonel Pope, a cycle manufacturer. The ride across Europe and Asia began at Liverpool and after nearly three years of excitement and hardship, the Berkhamsted adventurer reached Yokohama in 1887. He was a good lecturer and wrote a number of books, including Around the World on a Bicycle, Scouting for Stanley in East Africa (he hoped to meet Stanley, as he was by then a correspondent for the New York World), and Through Russia on a Mustang. In around 1895 he returned to live in England and married a widow, Mrs Vanbrugh, and so became stepfather to the celebrated actresses, Irene and Violet Vanbrugh. (They both came from Devon and rose to be acclaimed stars in their profession. Irene was created a Dame of the British Empire in 1941 and was well-known for her expressive interpretation of heroines in plays by Barrie and Pinero.) Tom eventually died in London in 1935.